Synopsis: Maria Worth has worked her tail off to make her exclusive dating service, Checkmate, a success. However, her gluttonous business partner, Petra Gore, has been more of a hindrance than a help, scaring away clients both with her disgusting eating habits and her habit of flirting with the men. Maria hoped to avoid this by secretly booking a romantic getaway for her clients at Tommel Castle. However, when Petra shows up anyway, her plans are, once again, ruined. And, when Petra is found murdered, just about everyone, including herself, is a suspect. Fortunately, Hamish Macbeth is on the case. Review: Thanks to a number of distractions, it took me a bit longer to get through this book than it normally does and, for a while, I was beginning to wonder if I would have to renew it from the library. However, I was able to finally get through this murder mystery a couple days ago and, after doing so, have to say I enjoyed every minute of it. 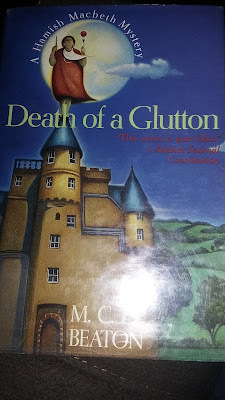 This book was similar to many of the earlier Hamish Macbeth books that got me hooked on the series. There is a murder victim that is so horribly obnoxious pretty much anyone who meets her has a reason to dislike her and maybe even want to kill her. And, the mystery becomes even more complicated as the book progresses because of additional motives ranging from Maria wanting to get rid of her business partner, Petra's niece being the sole beneficiary if she dies and surprise revelations involving some of the guests having previous interactions with the victim. I also liked how Hamish Macbeth seemed to return to his former form after letting his girlfriend, Priscilla essentially solve a couple of the murders for him. The way he solved the case and, more importantly, tricked the murderer into confessing was definitely interesting. I even found I liked the ending to this book. This isn't always the case because many murder mysteries just don't seem to know when to end (this series is no exception). However, I found myself intrigued both by Hamish and Priscilla seemingly being ready to take their strange relationship to another level and by his unwanted promotion to sergeant, complete with his own constable. It'll be interesting to see how that will work out in future books. Final Opinion: This was an interesting mystery with a victim that pretty much had it coming and a bunch of potential suspects that had the means, opportunity and motive to do it. I would recommend taking the time to read it.